Greetings and salutations my fellow renovators. Sorry for the late posting, it’s just that the things I’m working on are not so photogenic. I did get around to finishing up most of the mudroom. 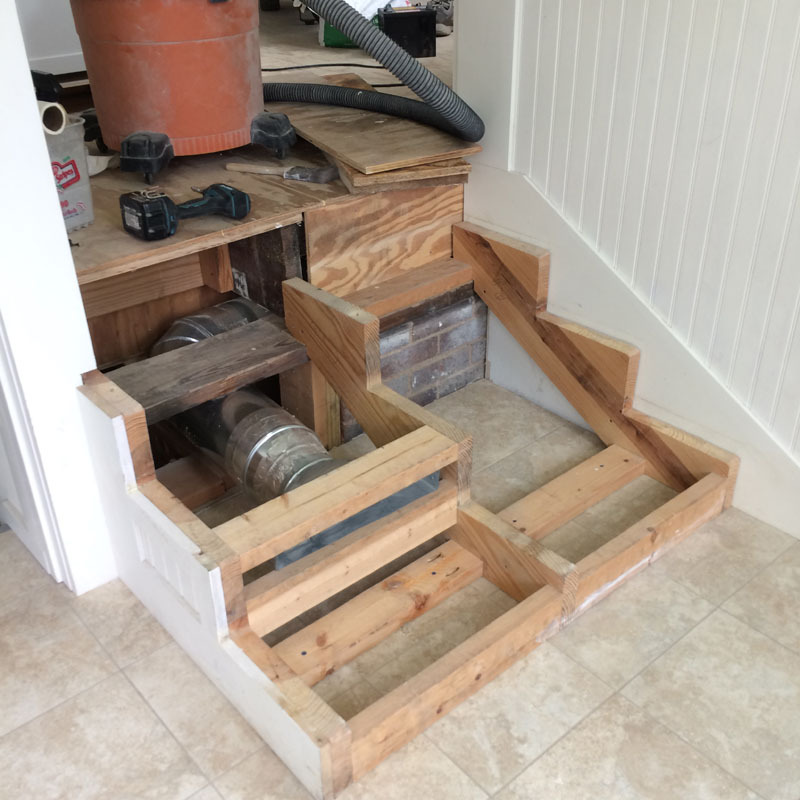 These are the three steps that go from the mudroom into the kitchen. You can see the old brick foundation and original floor framing members. I have a toe kick installed for a HVAC vent. Adding the risers and cut out the vent opening. This is a 2 1/2″ X 14″ toe kick vent. The door to the right goes to the woman cave. The textured glass lets more light in the stairwell. It matches all the other glass doors.Up the steps to the kitchen you see that pesky shoe storage bench and coat hooks. I am obsessed with little details. I like everything to be precise and finished. Here I milled small trim pieces to finish off the tile edges. 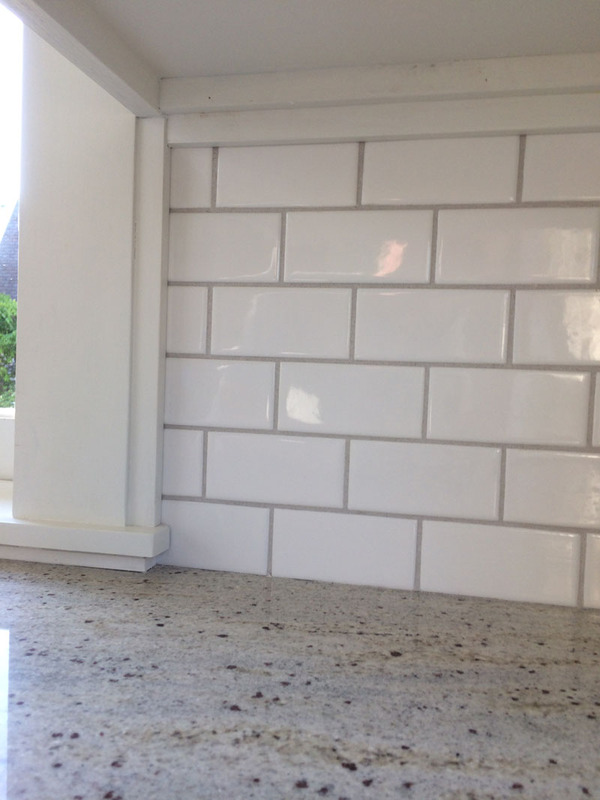 The thin strip under the window ledge is made from of PVC, to make sure there’s no water damage from a wet counter top. Instead of getting an expensive plugmold power strip. I cut a piece of wood at an angle and used this power strip. At 17.00 it’s a lot cheaper. 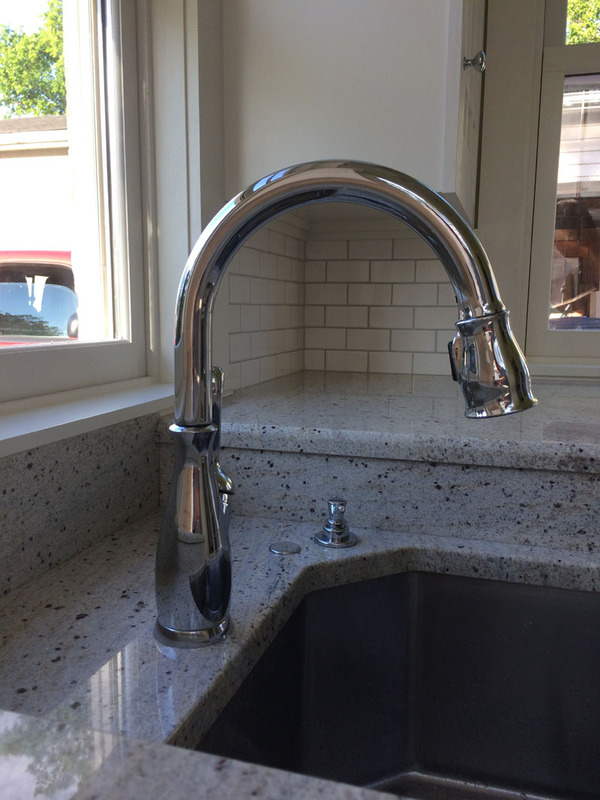 The Leland Single Handle faucet works well. The small soap pump and the electronic garbage disposal switch has an auto turn off after 20 seconds. I used very simple polished chrome knobs on all of the cabinets. These were 2.80 at Menards. 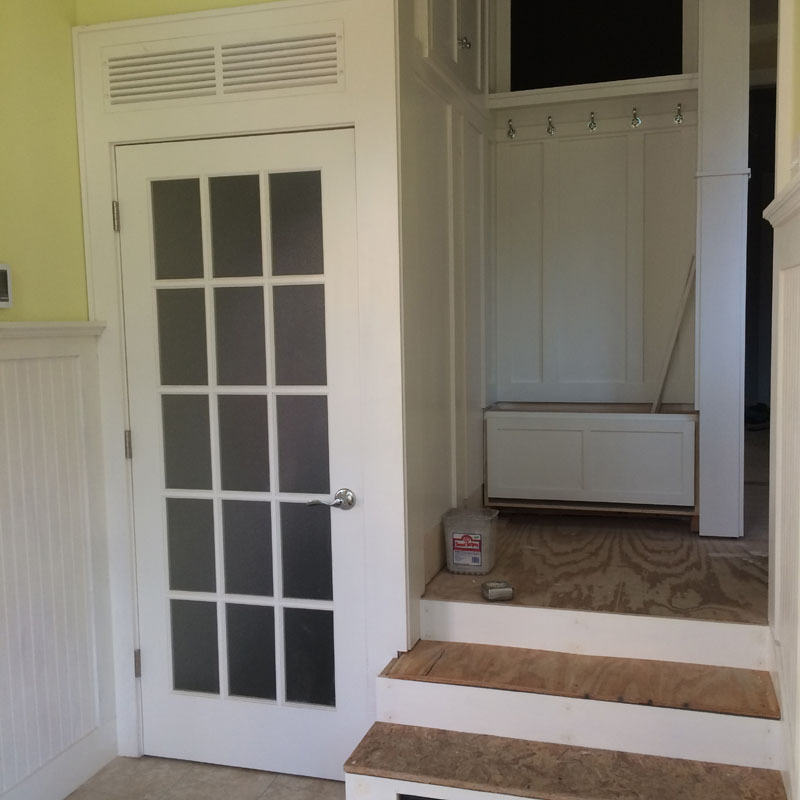 So there you have it – a nearly finished mud room. Sure I started building it in 2010, but hey, a guy has to take his time. I promise better posts in the future. We’re just getting started. 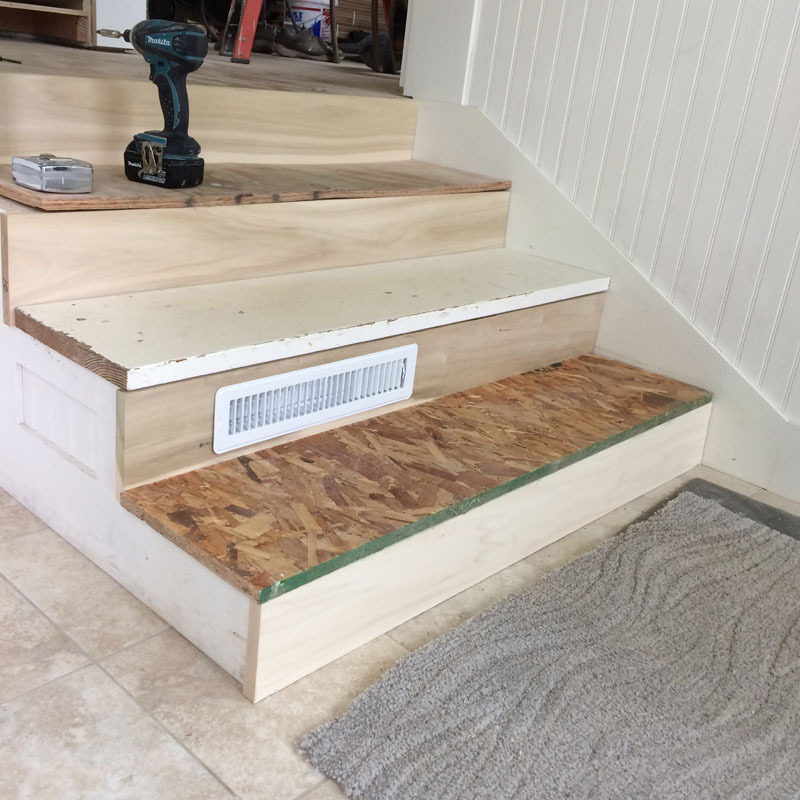 This entry was posted in Mudroom and tagged 1930's bungalow, DIY Home, Home Renovation, Old Home Renovation, Old house stair landing by curt. Bookmark the permalink. I LOVE IT! I am obsessed with those white subway tiles. We started remodeling our laundry room about 5-6 months ago and still have a ways to go, so I am afraid this will be several years in the making too. Yes, I thought the subway tile is appropriate for this 1935 bungalow. We’ll have a version in the kitchen as well. Good things take time – hopefully yours won’t take as long. Ha, ha! So true – I have an 850.00 tower drain in the first floor bathroom. I was obsessed with the thing and it caused all kinds of problems – and we have never used that bathtub yet. Oh, the pains of obsession. Thanks Ms. D! I’m trying to get to the pretty stuff by the end of the decade. 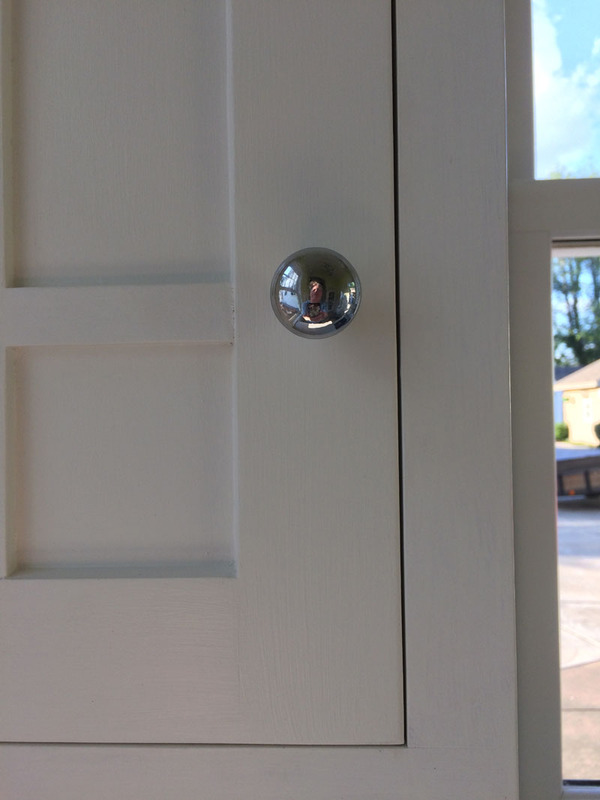 I love the precision fit of your inset doors! What’s your move-in ETA? My last house in USA had a dishwasher and a g. disposal. Iused to think garbage disposals were the rage…had to have one, especially after growing up in a house where all dishes were washed in the sink by hand and food wastes were composted or? Don’t really know what my parents did with larger items, small stuff ended up on the compost heap. Living in EU, for 10yrs I’ve never seen a garbage disposal in use, and sometimes not even a dishwasher! We Finns can recycle almost all our waste products to the point where we may have 1 undersink bin full in a whole month. All the rest of our waste is composted for our own garden, is recycled: i.e., cardboard, newspaper, cans, glass, plastics. That doesn’t leave much actual waste to discard when all rest is sorted out and recycled. Thanks Kate! I’ll have 3 disposals, so I guess I’ll never make it in Finland. Hope all is going well! Way too nice to get mud in!! Thanks Betty! – she’ll make me stay in the garage if I get too dirty. Great work, as always, Curt. What are the light fixtures in the ceiling? They look pretty cool. Hey Dan – thanks! The pendants were these: https://www.restorationhardware.com/catalog/product/product.jsp?productId=prod1157792 and as usual, this renovation is taken so long they’ve discontinued the product. Almost all the fixtures in my 1st floor bathroom are no longer made. Guess that’s called a ‘limited edition’ hope all is well in renovation land. Well, my subway tiles aren’t as fancy as yours. Mine came from Lowes @ 3.45 a 12″ X 12″ sheet. 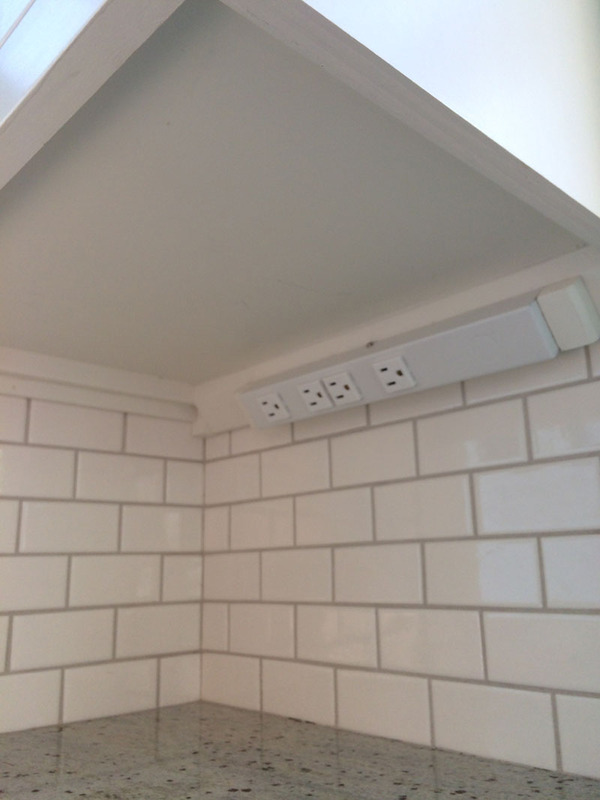 Subway tiles are appropriate for my 1935 bungalow, but they will also be in the kitchen – I think you’ll like the final look in there. Absolutely love this Curt. 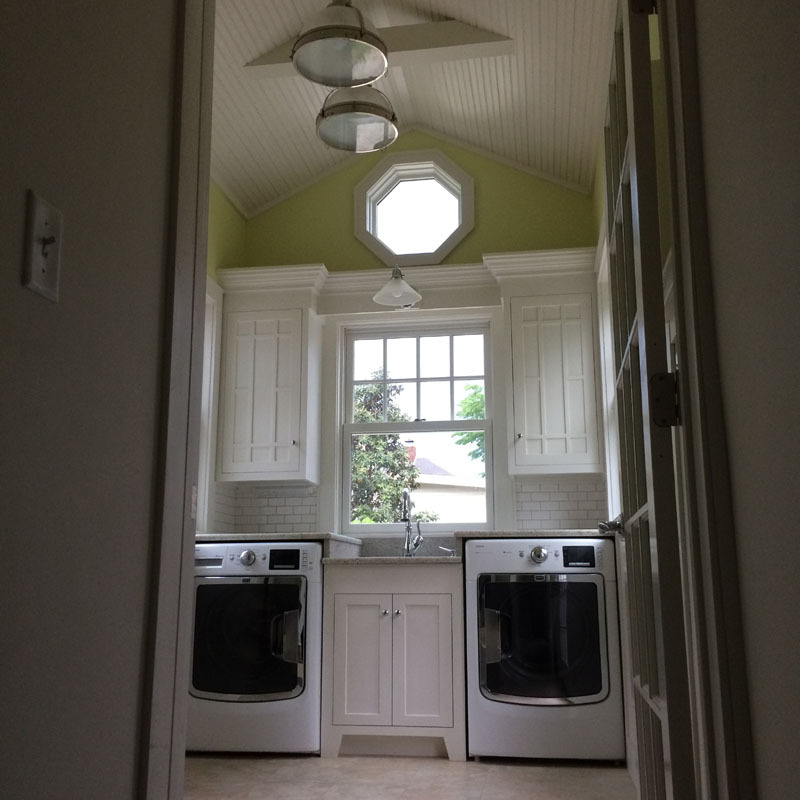 Wish you could have designed and fitted out a mudroom for me! Thank you so much Jacqui! It’s all pretty simple in design, except maybe for the somewhat lime green wall color my wife selected, but she was right, it makes this little room a happy place. All the best to you in S Africa.